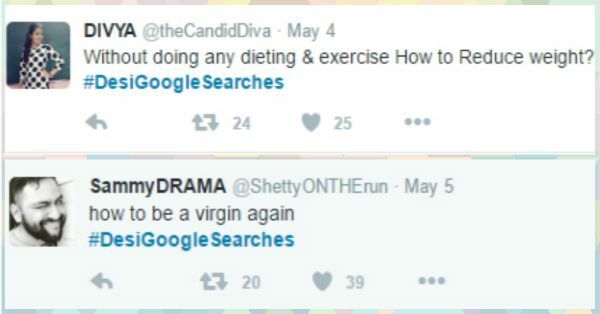 What Do Indian Guys & Girls Search On Google? Find Out Now! 1. The life of every engineer. #TrueStory Image: Milan Vaghela On Twitter 2. Kyunki...Hindi ka mazza hee alag hai! :p Image: Swagshank On Twitter 3. ‘Coz until now in my life, hing meant hing, universally. Image: DaaTanchi Tai On Twitter 4. When you can’t ask your mum, or your friend, or your boy… Image: Ruchi kokcha On Twitter 5. For we, as a human race, will not rest till we find the answer to this question. Image: DIVYA On Twitter 6. There never was a rival like Sharmaji’s son... Image: Hunट र र On Twitter 7. Making life easy, since reservations... Image: Anu Yaduvanshi On Twitter 8. And the legendary obsession with virginity... Image: SammyDRAMA On Twitter 9. Oh, come on… even I want to know what Google has to say about me. Image: TheSuperChatori On Twitter 10. This one is just the best, complete with Google’s search result too! Image: Doplhin On Twitter 11. Because, WTF is LMAO?! - IDK, dude. Image: Madhavan Narayanan On Twitter MUST-READ: These Girls Make Talking About Condoms & Stuff Seem So… EASY! MUST-READ: How Do Guys Buy Condoms? Varun Thakur Says Like THIS!